Every year around the holidays you'll see these little potted Norfolk pines in abundance in stores, ready to be decorated as miniature Christmas trees. Someone I know gets one every year for his desk. 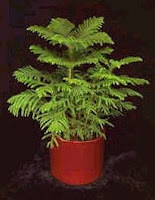 After Christmas, he tries to keep it alive as long as possible, but invariably it starts to dry out and shrivel up. It's about 12 feet tall! 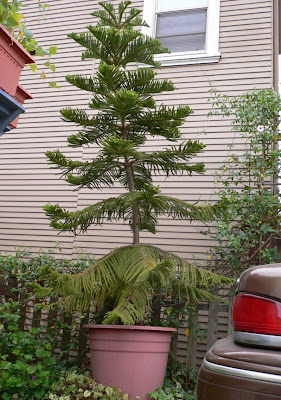 My friend wants to plant it in the ground one of these days, saying, "It deserves that," but I worry that it's the pot and the location that the tree loves. On the other hand, it's close to the point where it can never be moved again, even in the pot, it's getting so big. So it's a gamble either way. Impressive. I stopped buying those things years ago as I always killed them. Such a pretty tree though. Poutine from The Belgian Fry Co.
Dinner at C'era Una Volta in Alameda, Calif.